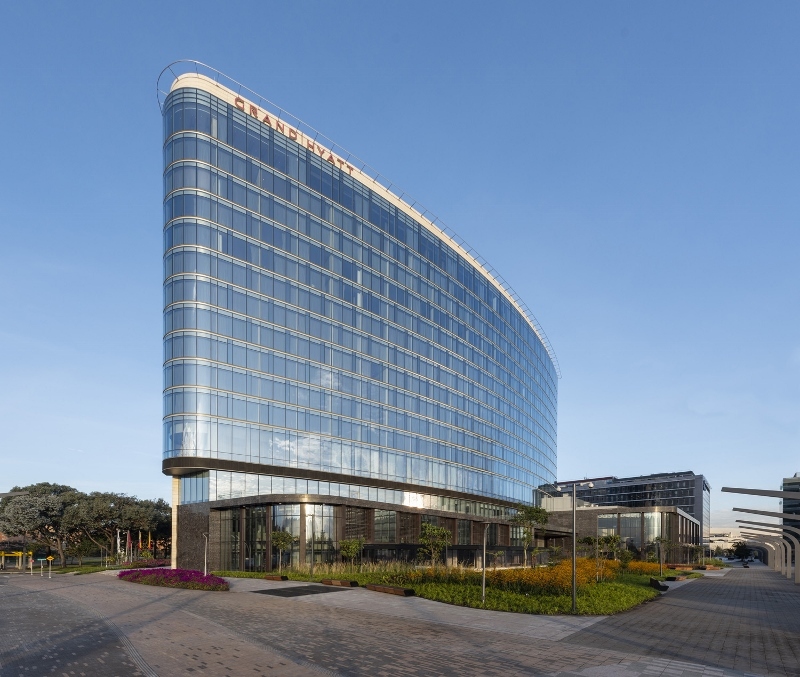 Architecture firm Goettsch Partners has announced the completion of the Grand Hyatt Bogotá, a new, 372-key hotel complex with a 230-foottall elliptical tower marking the symbolic centre of an 18-building commercial complex. 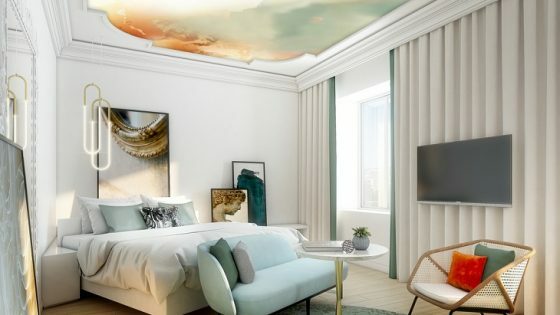 The new hotel, replete with helipad for visiting dignitaries, has debuted this fall as one of South America’s preferred destinations and accommodations. The Grand Hyatt Bogotá also signals another landmark addition to the extensive portfolio of hospitality architecture by Goettsch Partners – known globally as GP – spanning 30-plus major hotel projects and more than 50 million square feet of facilities on three continents. 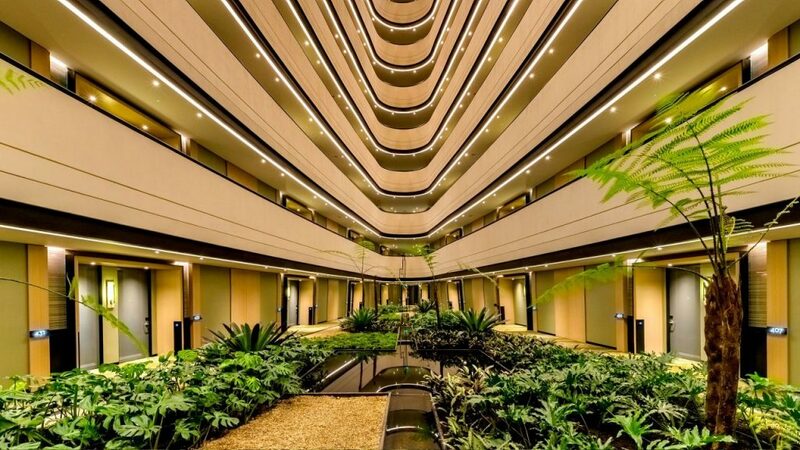 The project is the second for Goettsch Partners (GP) in South America, following the successful Grand Hyatt São Paulo in Brazil, which opened more than 15 years ago. 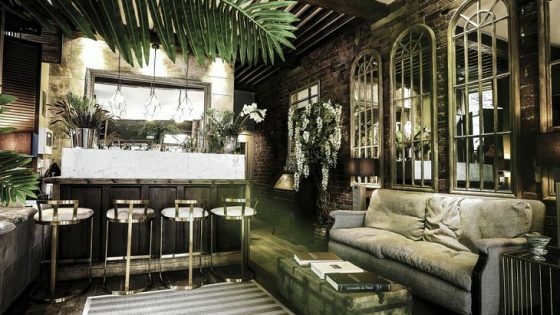 The new project, developed by the Luis Carlos Sarmiento Angulo Organization and positioned by operator Hyatt Hotels Corporation as the premier hotel in the city and the first Grand Hyatt in Colombia, has paired architect GP with Chilean interior design firm Studio Echeverría Edwards. The architect of record and general contractor is Construcciones Planificadas, and GP collaborated with an international team of engineers and consultants, including a bioclimatic expert. “This new hotel complex represents an exceptional opportunity to create a singular and completely modern touchstone in South America to draw both international travelers and dignitaries as well as Colombian businesspeople and families looking for the finest experience — and the largest ballroom — available in Bogotá,” says Travis Soberg, AIA, LEED AP, principal and director of sustainable design for GP. Designed to anchor the business district called Ciudad Empresarial Sarmiento Angulo and to integrate with its glass-and-steel office blocks set against the scenic mountain Monserrate, the Grand Hyatt Bogotá stands out in Colombia for its modern expression and incorporates leading-edge technology and design ideas. Unique to the region, the hotel is wrapped in a precision-engineered, blueglass curtain wall and detailed with wood millwork — both from Spain — as well as imported fabricated stone, among other high-end components. The Grand Hyatt Bogotá’s curving glass walls employ robust double glazing and a highly insulated envelope, ensuring quiet guestrooms and other interior areas, says Soberg. A three-story podium clad in warm stone, natural wood, bronze-toned metals and glass wraps the lobby, restaurants and other amenities, offering views into the hotel and through to the commercial area’s central paseo, or walkway, from the adjoining neighborhood. Outdoor dining and gathering areas connect the hotel to the paseo’s pedestrian life, creating an active urban space and inviting atmosphere.